Hit the Beach with Tiny Green Mom! Head to the beach fully prepared for a day of fun in the sun with your little ones in tow! We live in FL about 10 minutes from the beach, so a beach bag is almost permanently packed in the back of the car. 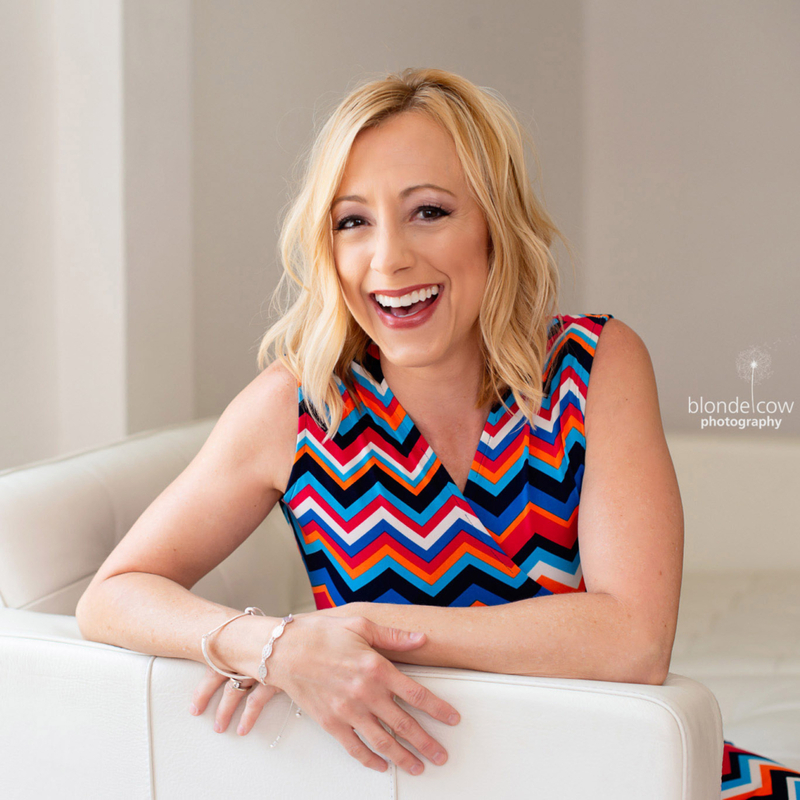 Along with the obvious beach bag staples, including towels, sunglasses and sun hats, we have added in the following essentials for a stress-free day at the beach! No beach trip is complete without swim diapers for our little guy! We love Babyganics Color Changing Disposable Swim Diapers, with a cute little frog that changes color when baby heads outdoors. The swim diapers keep baby covered and protected in water and on the beach, and the unique color-changing technology reacts when exposed to sunlight. The Swim Diapers are made with a core using sustainable materials that won’t swell or sag, and a water-resistant soft cover. We love that the diapers provide UPF 50+, as well! Available exclusively at Target. 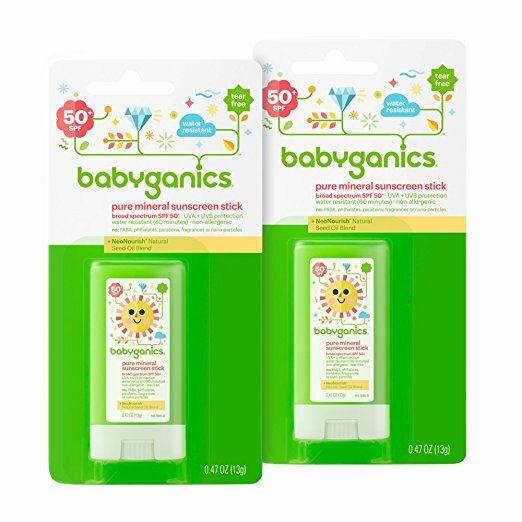 Tuck this brand new SPF 30 Sunscreen from Promise Organic Baby into your beach bag, which is a NSF/ANSI certified organic skincare brand exclusive to CVS. 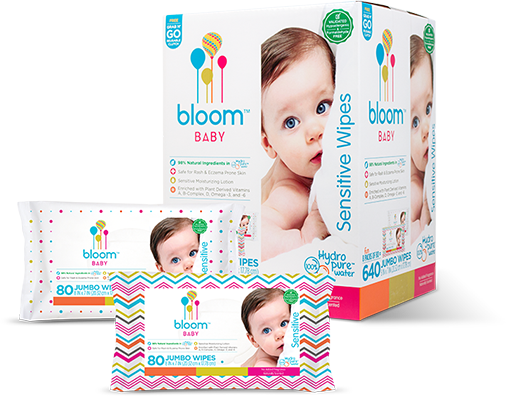 Promise Organic Baby is free of parabens, phthalates, harsh preservatives, synthetic fragrances and artificial colors. 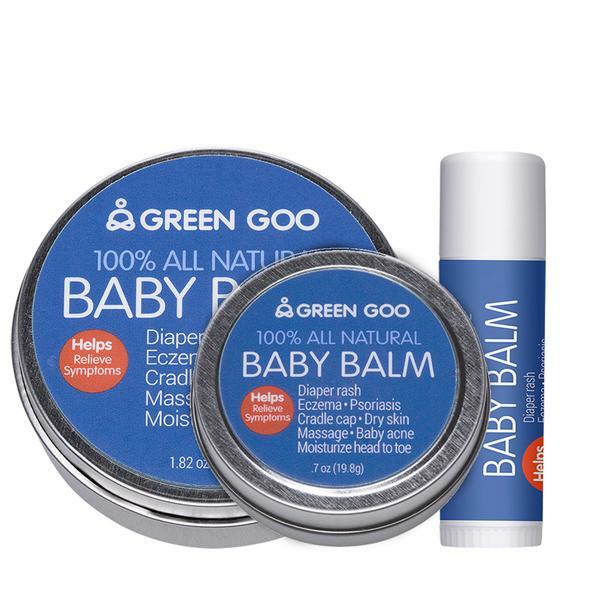 To calm and soothe baby’s sensitive skin, the Promise Organic Baby line is packed with USA-sourced oatmeal and rich coconut butter, a custom blend of organic coconut oil and Fair Trade Organic Shea Butter. 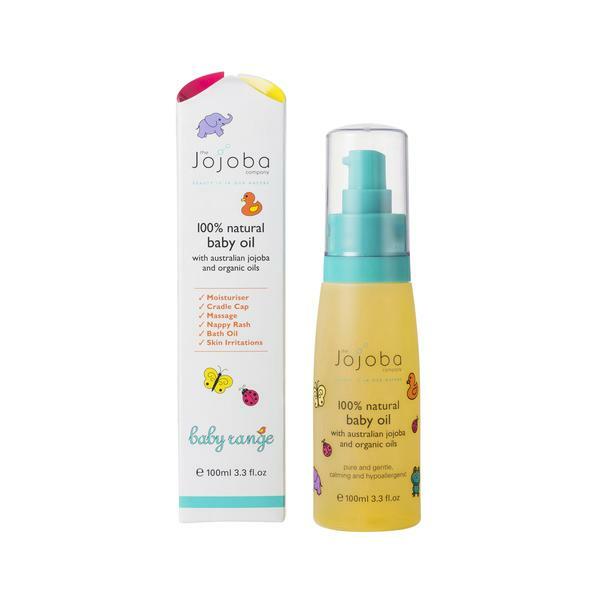 Not to mention, with prices ranging from $7 – $13, parents don’t need to make a tradeoff between organic and affordable. In addition to the sunscreen, the line also includes Coconut Butter Baby Lotion, Coconut Butter 2-in-1 Baby Wash, and Coconut Butter Diaper Rash Cream. Available exclusively at CVS. 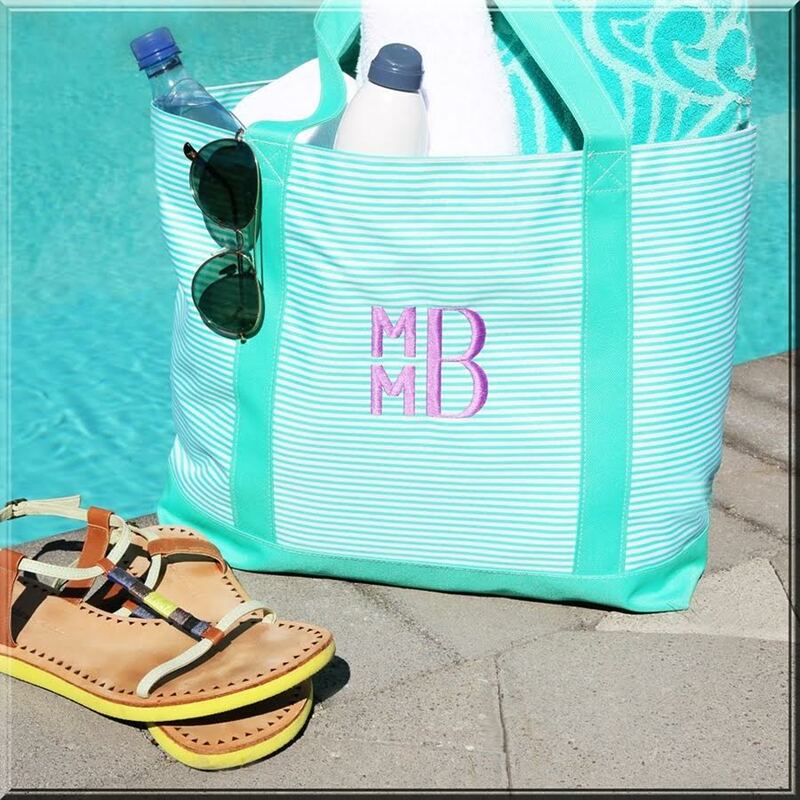 Carry all your essentials for the beach or pool in a chic, monogrammed tote! ​Lightweight and spacious, the Stylish Summer Totes from Krafty Chix ​are the perfect summertime bag. ​They’re spacious and fashion-forward so you never have to sacrifice your style….no matter where you may roam this summer! 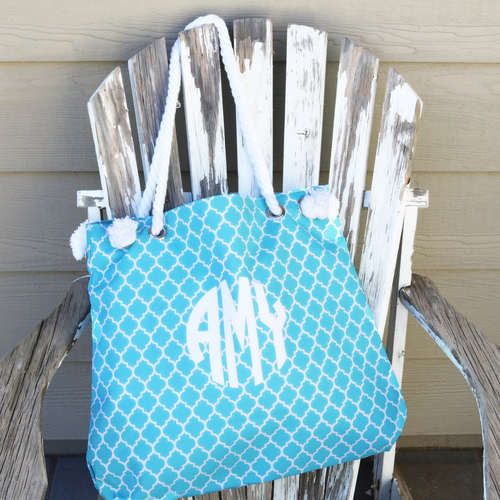 Available in 4 bright & fun colors in a quatrefoil pattern, the totes are lined inside, and include one zipper pocket for keys, etc.​ With rope style handles, you will look stylish all summer long! Plus, they are easy to keep clean! 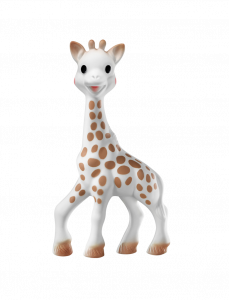 Check them out on KraftyChix.com. It’s no surprise that this might be our favroite item of the summer! The EverEarth Beach Blanket Pool is you guessed it… a a beach blanket and a pool, all-in-one! 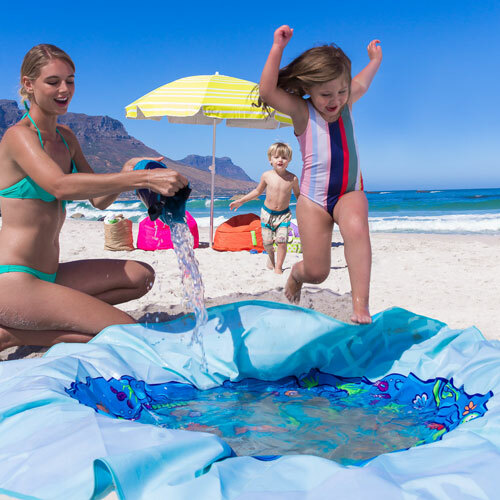 it can be used either as a blanket while relaxing or playing on the sand or grass… or flip it over and it becomes an instant kiddie pool! Our little ones stay cool, refreshed and nearby while playing at the beach. It’s easy – simply dig a shallow hole, place the blanket over the top, fill with water, and the blanket has been magically transformed into your very own pool. The Blanket comes in an adorable & convenient bucket-shaped bag that also acts as a waterproof bucket to carry the water to fill the pool. The well-thought out design of the Beach Blanket Pool makes this a must-have for any beach outings this summer. In addition, EverEarth is made from TPU (Thermoplastic Polyurethane) instead of PVC, which is in most kiddie pools. Instead, EverEarth uses a material that is phthalate-free, biodegradable, recyclable, and has helped reduce carbon dioxide output by 20% based on similar PVC outputs. It also features recycled packaging. You can learn more here. Make sure the little ones have a place to sit and enjoy a snack beach or poolside… without their food ending up covered in sand! Portable and perfect for feeding your baby or toddler on-the-go, ciao! 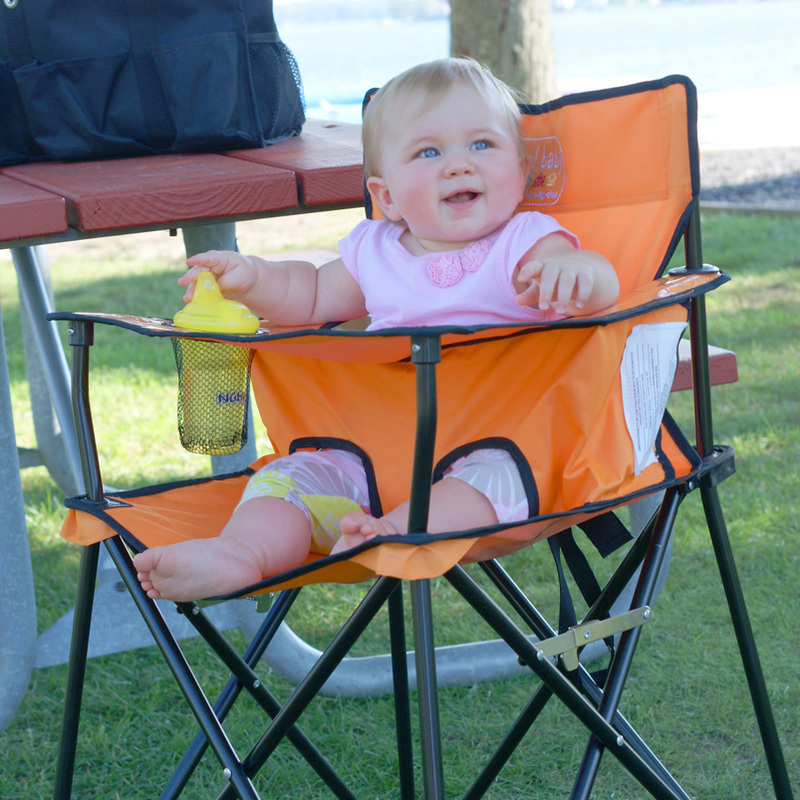 baby The Portable High Chair is the go-anywhere-highchair that is a must-have this summer. It is a time-saving, portable highchair created for babies & toddlers up to 3 years old. With a cup holder built-in and a clear vinyl tray cover, you are ready to feed your little one at a moment’s notice. We love that we can set up it up immediately upon arrival at the beach, place our little guy in it with a sippy cup and snacks, and set up our beach blankets, etc. ciao! 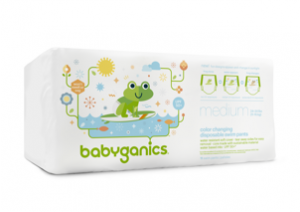 baby unfolds easily, locks into place and folds up in seconds when we are ready to go. It has been tested and approved to meet ASTM high chair standards, and is available in a wide array of colors. Plus, they even have a handy clip-on umbrella to keep the sun off of your little one! See all the color choices on their website. 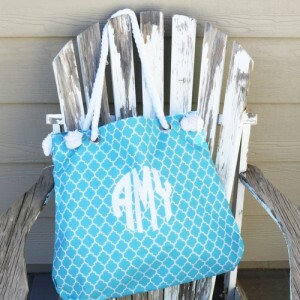 http://tinygreenmom.com/wp-content/uploads/2017/06/Krafty-Chix-Beach-Bag.jpg 900 900 Tiny Green Mom http://tinygreenmom.com/wp-content/uploads/2018/07/logo-sm.png Tiny Green Mom2017-06-17 04:58:512017-06-17 11:33:52Hit the Beach with Tiny Green Mom! School’s out for the summer! For the hungry beasts rummaging through your pantry and refrigerator, keep organic, all-natural and Fair Trade Certified snacks on hand and in plain sight for them to grab easily after a hard day at play! 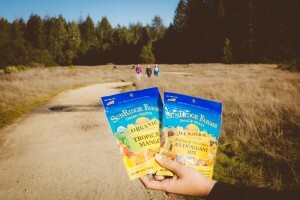 One of our go-to brands in the Tiny Green Mom household is SunRidge Farms! This family-owned company offers delicious snacks you can feel good about offering to your family. 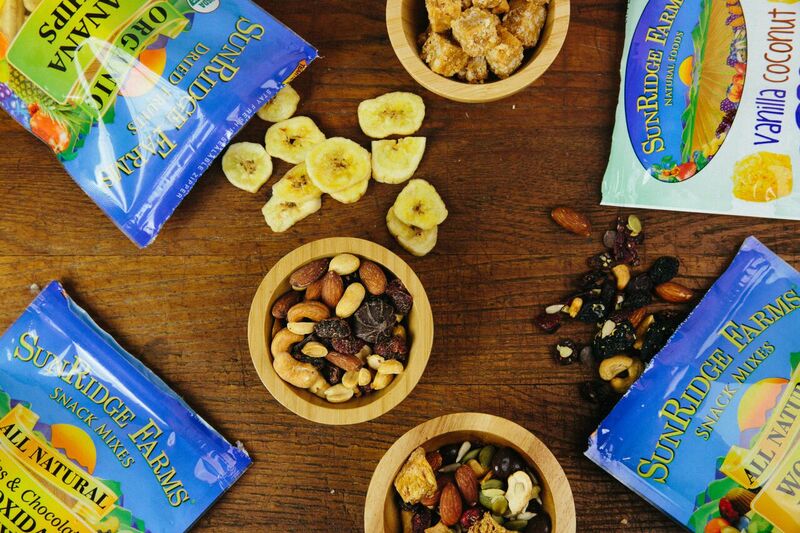 Whether you pack their Organic Banana Chips in your little one’s lunchbox for summer camp, or nosh on their Berries & Chocolate Antioxidant Mix as an afternoon pick-me-up, SunRidge Farms has the entire family covered when it comes to snacking! 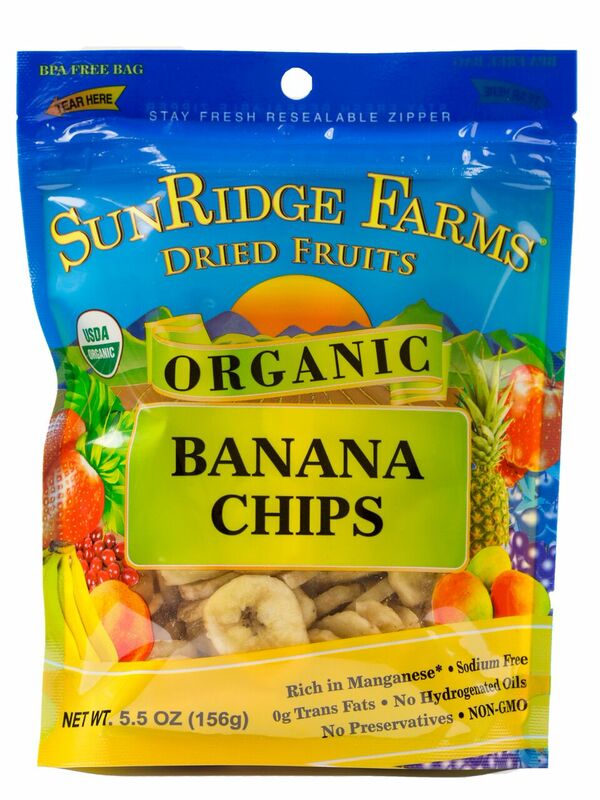 The organic snacks offered from SunRidge Farms contain no chemical fertilizers, pesticides, or herbicides in growing and processing, no artificial flavors, colors or preservatives, and no hydrogenated oils or trans fats. 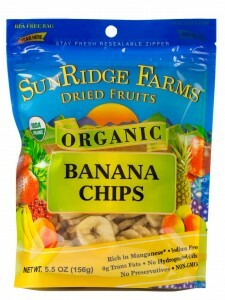 In addition to purchasing the snacks individually, you can also purchase SunRidge Farms foods in bulk! Did you know that organic bulk items are 89 percent less expensive than their packaged counterparts? SunRidge Farms can be found right in the bulk aisles of your local grocery or health food store, including Whole Foods Markets. 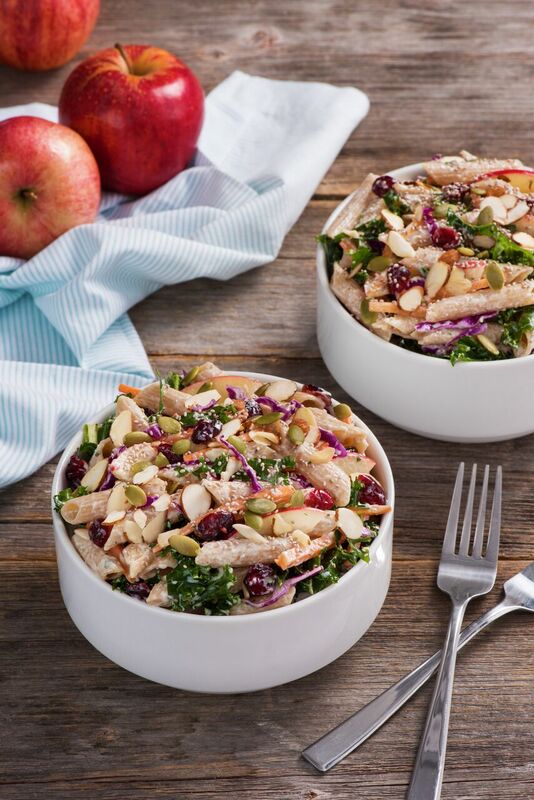 SunRidge Farms is a family-owned company based in Royal Oaks, CA. It’s manufacturing facility is powered by 2,500 solar panels, eliminating more than 1.3 million points of CO2 annually. The company also uses biodiesel delivery trucks and hybrid cars to power its sales team and offers employees $5 a day to bike to and from work. You can learn more here. 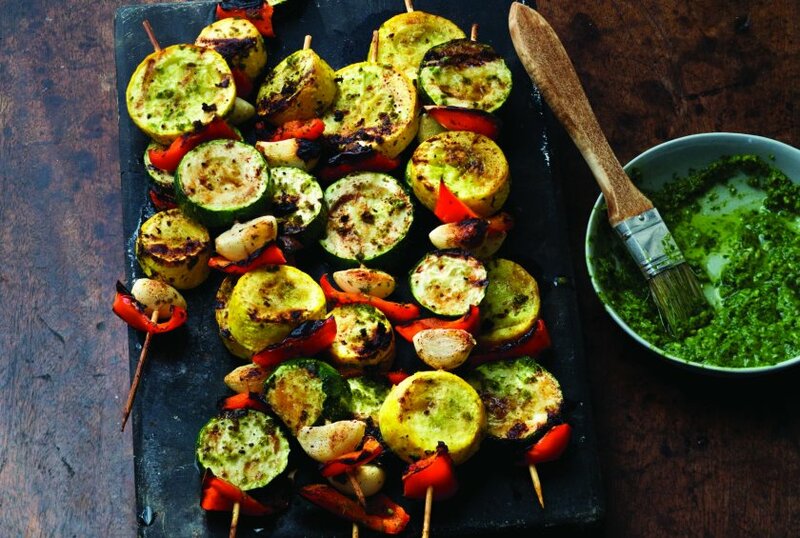 Fresh, lively summer veggies are perfect for grilling, and this chimichurri sauce dresses them beautifully! Handfuls of basil and parsley blended with finely chopped garlic gloves, olive oil, and a little salt & pepper…and you have a gorgeous sauce! For the skewers, place the garlic cloves on a small baking sheet, drizzle with the olive oil, and toss well. Roast until lightly golden, about 10 minutes. Transfer to the bowl of sauce. Add the zucchini, yellow squash, and bell pepper to the bowl and toss well. Thread the vegetables and garlic cloves onto skewers and set aside. Preheat a grill pan over high heat or an outdoor grill to high. Grill the skewers until lightly brown and cooked through, about 3 minutes per side. Drizzle with any remaining sauce and serve hot.